Something happens to me in the summer and I buy berries like I buy chocolate…frequently and in bulk. As I stroll (can a preggo gal shopping with two kids actually stroll?) race through Sam’s Club, something about the berry aisle calls to me: you need more berries. And so I throw in another vat and five days later find myself with a refrigerator full of about-to-mold plump, juicy berries (and a tummy ache from eating them at every meal). 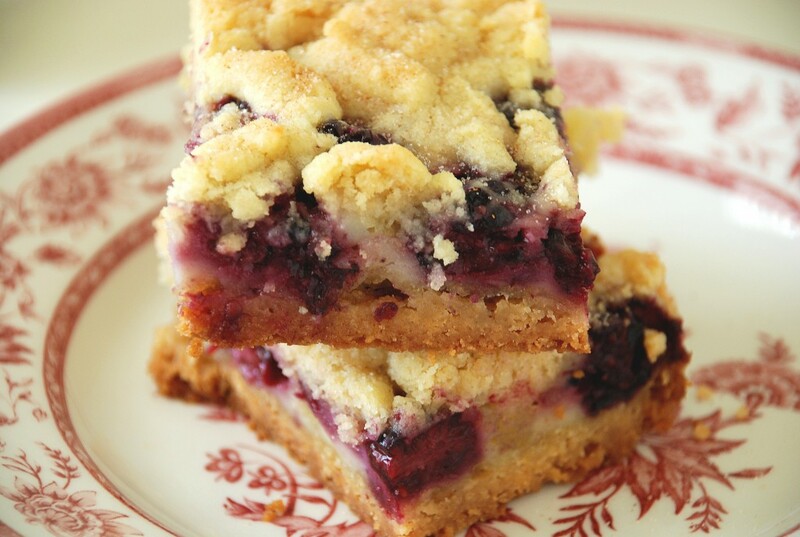 These bars are the perfect antidote to Berry Buying-itis. While fresh blackberries are juicy, sweet and cheap, do yourself a favor and throw these together. Rich and melt-in-your mouth buttery…you’ll definitely hate me in the morning. For my second test batch, I threw about 1/2 teaspoon dried lavender (McCormick’s makes it; it’s right in the spice aisle) in with the filling. I absolutely loved it. Preheat the oven to 350. Spray a 9×13 pan with cooking spray. To make the crust, combine flour, sugar, salt and cinnamon in a food processor and process for about 30 seconds. Add slices of butter and process JUST till butter is evenly distributed and mixture is still crumbly. (If you go too far it will be more like dough.) Reserve 1 1/2 cups of flour mixture for topping. Press remaining mixture into the bottom of the pan. Bake for 25 minutes or just until golden. Cool 10 minutes before spreading filling on top. To make the filling, combine eggs, sugar, sour cream, lemon juice, flour and dried lavender (if desired) in a large bowl. Fold in fresh blackberries. Spoon the filling evenly over the crust. Sprinkle the reserved crust mixture over the filling. Bake 45-55 minutes or until topping is lightly browned. Cool for at least an hour to allow bars to set.